We’ve have two options for a unique farm stay with us. 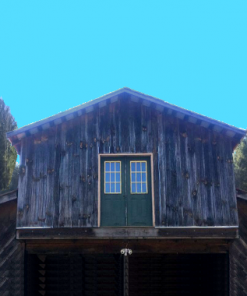 This fully furnished barn apartment has 3 bedrooms, a bathroom, a fully equipped large kitchen and community room that can comfortably seat up to 20. 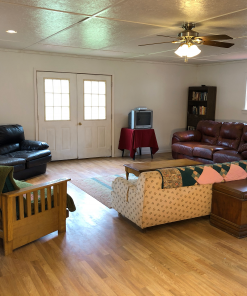 A fully furnished camper, with a hot tub, located in a very private setting with beautiful views of Bluff Mountain, over which the Appalachian Trail passes. Use the calendar below to see availability at a glance of The Thistle (the fully furnished camper). Use the left and right arrows, below the name, to scroll through the months. An incredibly romantic accommodation! 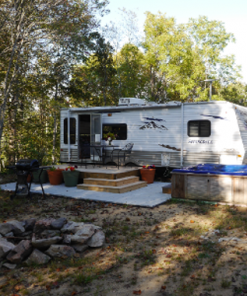 This fully furnished camper is located on a private setting with beautiful mountain views. Want to camp on the farm without hauling all your camping gear with you on your vacation?If so, we have the perfect accommodation for you! 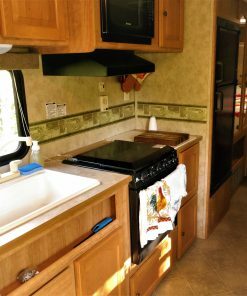 You are certain to be comfortable in this elegant camper featuring a hot tub, a queen short bed with a deluxe firm mattress, a fully equipped kitchen, and a bathroom with running water to enjoy a hot shower. For your comfort, the camper includes air conditioning. Outside you will have an outdoor grill, outdoor table and chairs, and a fire ring with complimentary firewood. This camper is situated on a knoll with views of the famous and beautiful Bluff Mountain, over which the Appalachian Trail passes. The camper sleeps 2 comfortably, but can sleep up to 4, for an additional $25 for linens and towels.